The name conjures up many different images. Many think it is a suburb of small semi-detached houses as they race by on Prince Georges Drive. For the few lucky who know this is not so. Just off the M5 one of the several bridges to the various islands transports you into near idyllic place to live. Here you don’t buy a house,you purchase a whole new lifestyle. 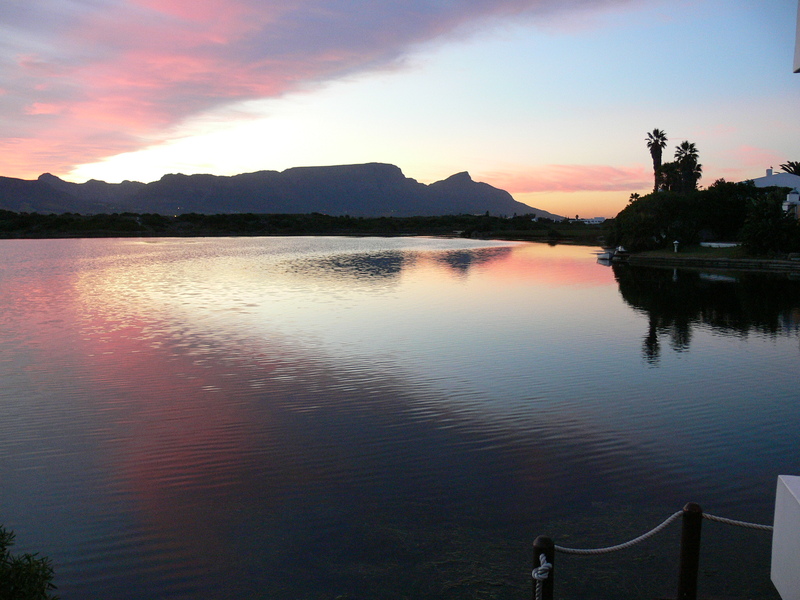 The marina was developed in the early 1970’s by Anglo American and is a brilliant series of waterways linking all the houses on the water and out onto the wonderful estuary of Sandvlei. You can leap into your canoe and if the thought grabs you,paddle all the way down to Muizenberg beach. The waters are clean and carefully monitored and abound with fish of all kinds. Because the water is saline but not as salty as the sea both salt water and fresh water fish are to be found with catches of Garrick over 20kg being recorded. Saline water also means that mosquitoes cannot breed. For animal lovers we have Cape lcawless otters,most often seen at night and are blessed with an array of bird life including King Fishers, Pelicans and our own two resident Fish Eagles. The gregarious duck population give endless amusement as do the Coots and the Crested Greebs with their young riding round on their backs are fascinating. The one access road to the islands with security checkpoints makes these areas safe and secure and results in a wonderful village atmosphere where people meet each other easily, often during the dog walk! The Oudevlei end of Marina da Gama offers the Uitsig peninsula Island and some really nice affordable houses in Oudevlei for the up and coming and executives in the making. Being close to the M5 makes for easy access to main arterials and it has a shopping centre across the road at Capricorn. Added to this is the bonus of being less than 10 minutes away from the major shopping Mall at the Blue Route. So don’t rush by next time,turn in and take a look and unfold Cape Towns best kept secret.